Picks from MBW 104: In a world, made of Chrome. Ubiquity atÃ?â? ?Ã?Â http://labs.mozilla.com/2008/08/introducing-ubiquity/Ã?â? ?Ã?Â for free from Leo &Ã?â? ?Ã?Â Merlin. Slife atÃ?â? ?Ã?Â http://www.slifelabs.comÃ?â? ?Ã?Â for free from Merlin Mann. Photomatix atÃ?â? ?Ã?Â http://hdrsoft.com/Ã?â? ?Ã?Â for $99 from Scott Bourne. BBedit atÃ?â? ?Ã?Â http://www.barebones.comÃ?â? ?Ã?Â for $125 from Andy Ihnatko & Leo. Great show … but can you post the link to Google’s extremely-well made comic that explains everything? Please? I find it difficult to believe Google’s explanation of the ULA. They can’t afford to pay a lawyer to make a new ULA so they copied and pasted it? No one is concerned where they copied and pasted it from???? All content uploaded to the web via Chrome becomes the property of Google. My Take on the EULA boilerplate (which is in a lot of places outside of Google, mind you), was that it is the draconian rules used INTERNALLY when a project is not yet public, to ensure that it stays with Google. That is, it was practically an NDA of sorts, that would allow outside contracting or work for hire if needed, if that is even part of Google Culture. A bit that they tack on every project they have going within the campus. And when the project was released to the masses, that bit of boilerplate stayed in the EULA. Plausible? I made it up. But it seems plausible to me. 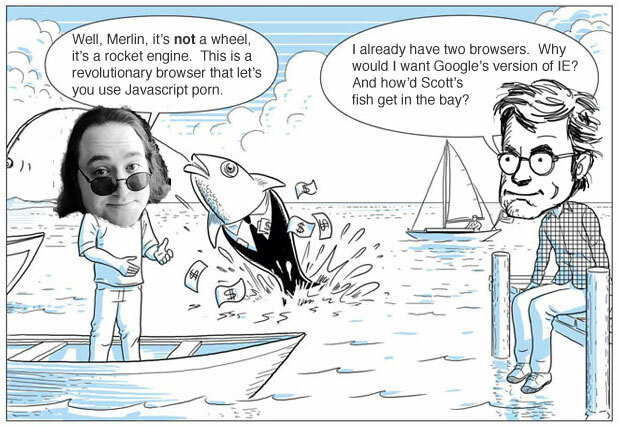 Of course there are aspects of Chrome that are definitely in Googles self interest; but it is in more of a meta way of supporting other business models, rather than trying to cop everything you do with a tool they develop.